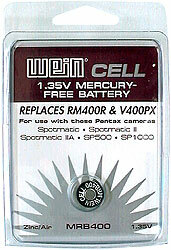 Exact-voltage replacements for the now unavailable mercury cells used in hundreds of cameras and meters. Environmentally "green," 1.35V, zinc-air WeinCells are available to replace PX625/PX13, PX675 and RM400 batteries. 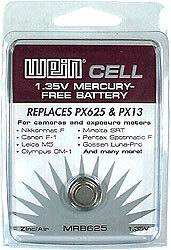 WeinCell™ Mercury-free Replacement Batteries - new life for your old camera! • Compatible with any camera or meter specifying the respective mercury battery (see battery guide). • Three models available; compatible with hundreds of cameras and meters. • Voltage output more stable than alkaline replacements. • No camera/meter adjustment or adapters required. • Up to 10-year shelf life; the WeinCell is not activated until the pull-tab is removed (removing batteries from equipment and replacing tabs prolongs battery life). a division of Fargo Enterprises, Inc.